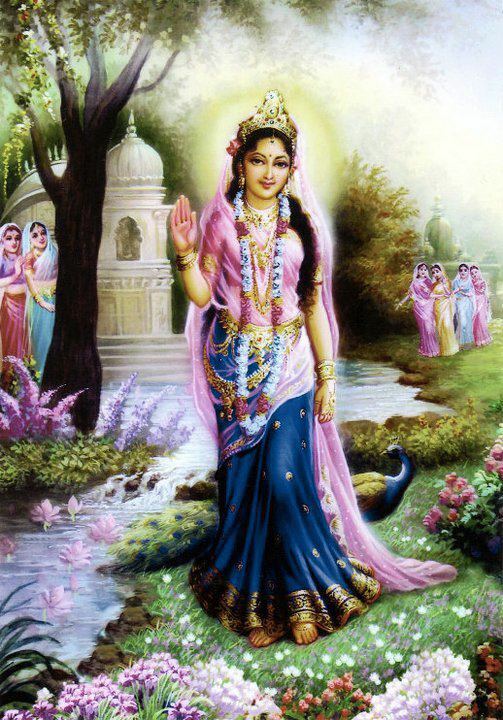 The name of Radha Rani is my real wealth. Due to the glory of Radha Rani's name shyamsunder became the crest jewel of 'Rasiks' with the grace of Radha Rani's name lord krishna attracted all the gopies in Braj by playing the flute. It was due to the glory of Radha's name that in the age of Dvapar shyamsunder performed the Maharas Dance in Braj. The supreme lord runs anxiously towords the place where he hears the sweet name of Radha. If it were not for the 'R' in the name 'Radhey' (in Radhey-shyam) shyam would be incomplete (Adhey shyam, i.e. half shyam). says shri 'Kripalu' "chant the most glorious name of Radha twenty-four hours a day to taste the sweetest nector of love." O Radha Rani! Do not delay your arrival. standing at your doorstep. I am begging for alms of your grace. from the Rasik saints I have heard that destitute souls are always treated with respect in your court of mercy. I am holding on strongly to the faith that your delay does not mean that you will never come to me. your delay will not cause me to renounce faith for I am extremely foolish and stubborn. says shri 'Kripalu' "O kishori ji! come quietly and reval your divine form to me. I promise not to tell anyone."